BEDFORD, Mass., September 6, 2018 — VoltDB, the enterprise-class database that powers real-time intelligent decisions on streaming data, today announced extended capability for building real-time applications in public, private and hybrid clouds. With full support for Kubernetes, an open source platform for automating the deployment of application containers, and availability in the AWS marketplace, VoltDB is delivering more flexibility and speed when building real-time applications. 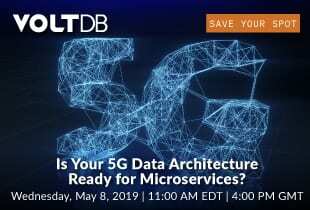 With the growing reliance on the cloud and the pending roll out of 5G networks, enterprise organizations are moving away from monolithic applications and toward microservices, which empowers more rapid and continuous application delivery. As a highly scalable containerization platform, Kubernetes is a top choice for more quickly developing and deploying a real-time application. VoltDB’s new Kubernetes module enables organizations to automate the deployment of VoltDB clusters, reducing application development timescales down from months to minutes. Organizations can now orchestrate VoltDB Docker clusters with Docker and Kubernetes, simplifying the development of real-time applications. As one of the only SQL-based data platforms to support the stateless nature of Kubernetes, VoltDB empowers organizations deploying microservices to spin up and spin down VoltDB docker container clusters, monitor running clusters and monitor and update clusters on an ongoing basis. “As we help our customers monetize and capitalize on their 5G investment; VoltDB is the only in-memory operational database suitable for real-time software solutions and services to enable service providers to create new revenues from digital services and improve customer engagement” said Tony Gillick, VP of Solutions Management, Openet. In addition to expanded support for Kubernetes, VoltDB Enterprise Editions is now available on AWS Marketplace, streamlining the process for customers to buy and consume VoltDB with a one-click purchase and single, simple payment through existing AWS billing. Read additional details.